We had a family event to attend at Vizag and since that was a Friday we chose to stay there the weekend and explore Borra Caves and Araku Valley. As I read a lot about how the train journey from Vizag to Araku is a must, I decided to take it and they weren’t wrong!!! I didn’t have a reservation and took an unreserved ticket. Like a typical unreserved compartment, it was brimming with people the moment it entered the station. We too got in and for the first time I discovered a new side of my man – with all fierceness, as if was a regular, he threw the backpack on the seat-top luggage rack and climbed atop it and sat there (don’t freak out, it’s a very common scene in unreserved compartments in Indian Railways)!!!!! Whatever I read about this route was completely true! It’s a 4 hr ride and after 1 hr, the train stops for about half an hour at Boddavara Station, before taking up the ghat-track! Then it gets slow, I mean, it’s actually mountain railway from this point of time! The route is green, surrounded by deep valleys, rivers, bridges and best of all, so many tunnels!!! It was a blessing in disguise that we got into the unreserved compartment - the ‘life’ in the compartment was so much!!! It was so lively. I got down and stood at the door, photographing the landscape, tunnels and greenery all around. Some people were already standing at the door, to be precise, a bunch of college boys! Guess what, inspite of being surrounded by them, they absolutely did not misbehave and nobody tried to touch me!!! I’m specifying this here particularly because of the generalizations many assume about various places. Stray unfortunate incidents do happen, but please don’t generalize an entire country! 3 hrs (90km) from Vizag on this train, I reached Borra Guhalu station. A short walk from here took me to the entrance of Borra Caves. Borra Caves is at an altitude of 800-1300m above sea level! It was discovered in 1807 by William King, a British Geologist, when India was a British colony! These caves are believed to have been formed about 150 million years ago. Remember those school day geography lessons that taught about stalactites and stalagmites? This entire caves is filled with those. Today most of these formations are under worship as various Gods & Goddesses according the natural shape that has formed. The walk inside the caves is about 350m. One, the entire caves is filled with disco lights!!! It’s sad for someone like me who is actually interested in the heritage and natural beauty of the place. But then, that’s just my opinion. But what was totally disheartening was the behavior of the visitors… People were shouting, noisy, once in a while giving a ‘whooo’, using flash photography on the bats hanging from the ceiling etc and it was just painful for people who respect the place! I really hope APTDC takes efforts to educate tourists at the entrance of the caves and employ a few more staff to regulate the behavior of the unruly tourists!!! I’ve been wanting to see Borra caves since ages as its one of the very few caves in India that has stalactites and stalagmites. Unfortunately my overall experience was just depressing!!! If you're a non-vegetarian, the bamboo chicken here is a must try. Its available as street food at the entrance of Borra Caves. Its chicken nuggets, sealed in bamboo and roasted! No, I haven't tried it, being a veggie, but heard way too many people swear about it! From there I took a bus and an hour drive took me to Araku Valley, my next destination. Here comes the disaster. Let me put it in simple words. If someone goes to New York and then wonders why he/she couldn’t see San Fransisco in the trip, how would that sound???!!! Now imagine the same thing in a smaller scale! The area termed as Araku Valley is not even in Araku!!! The Anantagiri Mountain Range (whose valley is Araku), is where nature’s beauty & bounty lies, and that is pretty far is the Araku Town! There is actually nothing at all in Araku Town!!!! Araku Valley Region is pretty large and there are 4 different APTDC operated hotels in this region itself and 2 (Valley Resort & Mayuri) of those are in Araku Town! The rest 2 (Mountain View & Tyda) are on the way from Vizag to Araku Town, infact, even before Borra!!! These 2 are much better as these are within the forest area, surrounded by vegetation. 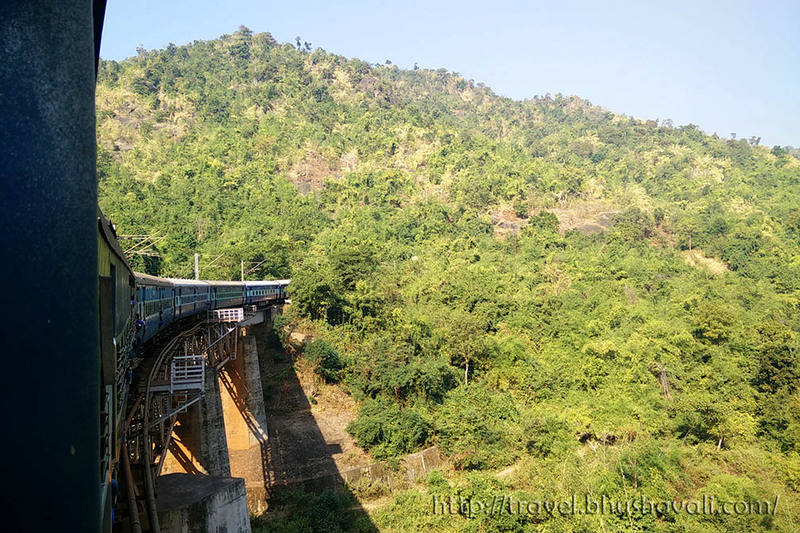 When I booked I knew I wanted to go to Araku, but I did not know of all this before I ventured. There was a room available at Tyda and when I called them I came to know it’s not in Araku. Since I wanted to go to Araku, I just booked at Valley Resort when I came to know that Tyda is actually 35km from Araku!!! Little did I know Tyda is a beauty by itself whereas there’s absolutely nothing in Araku Town. Yes, there are a thing or 2 in Araku Town – Coffee Museum & Tribal Museum. I ventured only to Coffee Museum. It’s a tiny private museum and there’s an interactive display inside that talks about the worldwide history of coffee and there’s a shop where organic, authentic coffee was sold. Also there’s a café which sells a wide variety of hot & cold coffee and desserts made of coffee as well!!! It is slightly pricey but the coffee is just divine. The outdoor seating arrangement was really cool and there was also a rodeo simulator and a cricket pitch simulator as well. By evening a nice traditional, tribal dance was performed. Araku/Borra from Vizag: There is 1 passenger train (58501/2 - Visakhapatnam <-> Kirandul) every morning from Vizag at 7 AM and from Araku/Borra at 4/5 PM. Buses are regularly available on this route for every half hour from about 6 AM to 10 PM. Dedicated to Venkat. Special thanks to Puneet for practical info on the places. Whoa. I did not even know about Araku till I stumbled upon this place. It's sad that the government doesn't bother to either promote or safeguard such gems of destinations. India has so much beauty which needs to be promoted and preserved at the same time. Oh wow these caves look magnificent. India has so much to offer the avid adventurer. I love a good train ride and would gladly to do this one as you did. So happy to read that the boys were well behaved. Like you said one bad moment can ruin the reputation of all. We remember visiting such a cave in Belgium and marveling at it little did we know that we have such wonders in our backyard itself, in India ;) We agree that the visitors need to be educated about behaving in such conserved locations to help preserve them. AP definitely has some awesome places to visit and looks like we need to plan one trip soon. It's always fun discovering new places within the country. Had no clue about the caves or this route which by the way looks fantastic. It's also great to see a tribal museum because at least in the metropolitan cities we often forget that there is lot more to Indian culture and the heart is really out there in the countryside. Thanks for all the details as well. Have always wanted to visit this area. The sheer antiquity of these remains are minboggling. But I am also not very comfortable with the colourful lighting. It just distracts people from the real thing. Uniform light of one hue would be better I guess. It's too bad you had to encounter such unruly visitors at the Burra Caves. I agree that the caves in their natural light would be nice to see rather than the artificial light show. It's unfortunate you didn't get to see the Araku Valley, but glad you made the most of your journey. It is understandable to place lights in the cave but I disagree with the choice of color. They are too bright, distracting and could be an eye sore. I would prefer just an ordinary light so that visitors can appreciate the rock formations. Is there a place to eat the bamboo chickens? Or just by standing? What an interesting place, l love exploring in caves. I never knew that India had caves and Borra caves looks really cool. I completely understand what you are saying about wanting to see the caves without the disco lights in the natural way. I just adore train rides in general. Although they can be over crowded, but still I can find magic in them. I am so sorry for your disappointment in the cave. I agree with you, the natural way is the best. Nature is the best artist ever! Wow interesting! Not sure how I feel about the disco lights but I guess it would be different! And yes I agree I hope they educate the tourists too. Glad you had a great time! It looks like you saw a lot of exciting things on this trip. I'm sorry to hear about the disco lights in the caves. And I'm even more sorry to hear that people were behaving disrespectfully. I'm like you--I'd rather see the caves in their natural state. That train ride looks absolutely spectacular! And so do those caves! It's unfortunate that there were some unruly tourists and disco lights in the cave. Nature can usually speak for itself. Great post though, loved all your insights! What an amazing trip. I am sure the train journey must have been very charming. But thanks for warning out on high large Araku valley is. We have been planning a trip and will keep this in mind. Only last week I came across information on Araku Valley when they started that Vizag glass-roofed train. Am so inspired to go! Train journeys in India can be adventurous. Hold on to that. The caves are magnificient by the way. Wow I have never heard of this place! It's too bad that tourists were extremely noisy in the cave - it would have been so much more special if everyone was quiet and just taking in the amazing surroundings. Is this for real? Like seriously?! I have been to Vizag and I didnt even know of this place! India sure needs to promote caving in India. Now i know there are just so many options available! I like to see the coffee museum. I also would love the caves as there's so much to appreciate in the caves. Well done on your travels. It doesn't sound like a safe experience for females on a train ride in India. Your photos are stunning. On the contrary, if you read through the post (esp Para 3), you'll know that its perfectly safe!!! The Borra Cave looks wonderful. I also encountered rude tourists in my previous travel. Any guide should learn how to teach their guest how to act decently. The do's and the don'ts. The caves look so beautiful! I'm sad you didn't get to have the experience for which you had hoped. The lighting is lovely...I wouldn't think you'd need the flash. Thanks for including the directions, too! I agree. It`s quite saddening to see the disco lights. They probably just want to make the cave seem more fun to look at. However, for those who really want to see the natural state of the caves, it can be quite disappointing. Maybe a 1 color light that can help tourists see the cave more would be better. Such a beautiful place but the visitors should respect and nurture it else after a few years there is nothing left. I have been to AP but never visited Vizag. Should visit though for such beauties. Wow, this is such a great travel journey. The scenic views going to your destination is really beautiful.The cave looks really huge and the view inside is really beyond compare. I would also love to try their Bamboo chicken, that sounds really luscious. Thank you so much for sharing! We are also going to Vizag shortly for a marriage, but since the journey to Borra/Arakku is so long, we may not have the time to venture there. Need to know what is there to see in Vizag town itself - did you do any blog post on that? Didn't do a blogpost on it but here's a list - Yarada Beach & INS Kursura Submarine Museum are the lesser known places. The common places incl Kailasagiri, Tenneti Beach & Dolphin's Nose. I've heard the birding at Meghadhri Gedda Reservoir is excellent but couldn't find any practical information on that! Coffee Museum? How very curious. I've read a few history of coffee types here and there at those little flyers/leaflets they give out at coffee shops. I wonder how different a museum's write-up would be. What an adventure! I still can't get over those disco lights in the caves. Why go to the expense of doing that when its natural beauty is so special? It looks like you had a a great trip. I absolutely love your pictures of the caves. It would be nice to visit some day. India has a lot more to offer than the average person knows. The caves look amazing. I am sorry it was a little depressing due to the lack of respect from other patrons. Borra caves have been fascinating me for a long time now.i think that now after this post, I should head there the next long weekend. It sure seems beautiful. Would monsoons be OK here? It would be perfect will all the greenery! But opt for trains in that case, coz ghat roads and rain isn't a great combo! Is it ok if we return the same day? Can j cover both the places? Yes. You can see both places and return the same day if you're pressed for time. These Borra Caves are awesome! Keep Up the good work by letting us know about it!